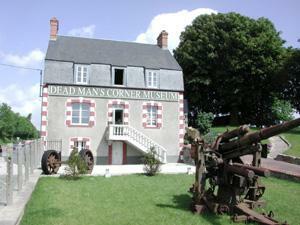 Dead Man’s Corner Museum at Saint Come Du Mont is located between Utah Beach and Carentan. This is a fantastic place to visit for fans of Band of Brothers. It is just 10 minutes from our cottages and bed & breakfast accommodation. Shortly after midnight on June 6th 1944, paratroopers of the 101st Airborne Division were dropped into Normandy. 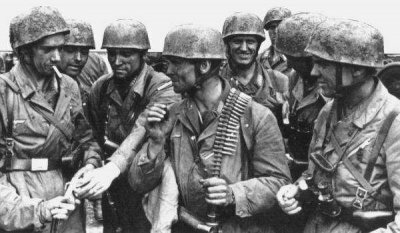 These would be the first allied troops to land in France at the start of the D-Day invasion; they were tasked with capturing Carentan. Standing between the 101st and the town was a heavily defended German position near the village of Saint Come Du Mont. This small village was occupied by elite German paratroopers (Fallschirmjagers) who were ordered to hold off the Americans at all costs. This town was of great strategic importance to the Americans as this would link Utah Beach and Omaha Beach. Due to the determined resistance of the Fallschirmjagers, the attack was stalling. As Utah was now in the hands of the allies, the attack was held up to wait tank support. There was only one road available for the recently landed tanks. This road from Utah Beach passed through Sainte Marie du Mont to the intersection at the Carentan / Saint Come Du Mont road. The house that was located at this intersection was vital to the Germans and was utilised as a headquarters. Later in the battle, it was utilised as a first aid station for injured German paratroopers. On June 8th, the area surrounding the road intersection witnessed fierce fighting. Now that light tank support had arrived, the armour pushed forward. 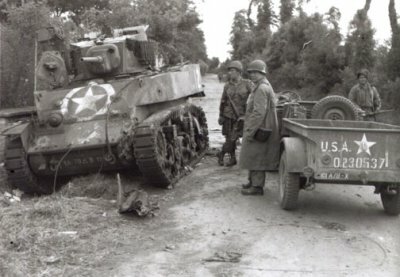 As the first American tank approached, it was hit by a German Panzerfaust and disabled; it’s crew killed by the explosion. As the Germans managed to keep hold of this area, the tank, together with the dead commander hanging from the turret, remained there for several days. The American soldiers would refer to this area as “the corner with the dead guy”; later, this was shortened to “Dead Man’s Corner”. It has been remembered as such ever since. The Museum houses a large collection of authentic German and American uniforms, equipment and other artifacts from World War 2. For fans of Band of Brothers, there is also a collection of genuine uniforms, letters and equipment from members of Easy Company, including Richard Winters.